Last week’s episode, “Blood Brothers,” might as well have been titled “The Beginning Of The End,” in terms of the overall narrative of Spartacus. Crassus and Caesar played their big move, a bold strike upon Sinuessa, through a combination of guile, brawn, and enough money to make the angels themselves renounce God. So what’s really left in these final five episodes other than the playing out the historically inevitable? Sure, there are plenty of indications that not every major player will die in the fashion told through history. But rather than simply play out the string, this show is attempting to forge bold declarations as to what its moral purpose has been all along. “Spoils Of War” is a title that refers not only to the glory and gifts that fall to the victors of this latest battle. It’s also an ironic commentary on the futile attempts to actually defeat Spartacus. Spartacus isn’t just a man, but an idea, at this point in the run. His name inspires thoughts within people that aren’t shaped by his appearance but rather what they believe him to stand for. Killing him is one thing. Killing an idea is something else entirely. And as we can see by Donar’s suicide, defeating the rebels does not mean defeating the rebellion. Spartacus didn’t raise an army. He also raised the consciousness of class long put under heel by the Romans. And yet, we spend the majority of this hour with those Romans, with Spartacus’ bruised and battered remaining forces only appearing as bookends. Part of this decision is purely practical: In terms of what’s interesting, it’s far more compelling to see Crassus set up shop, Caesar get a long-awaited haircut/shave, and Tiberius descend further into assholery, than it is to watch Saxa march a few miles with a limp. 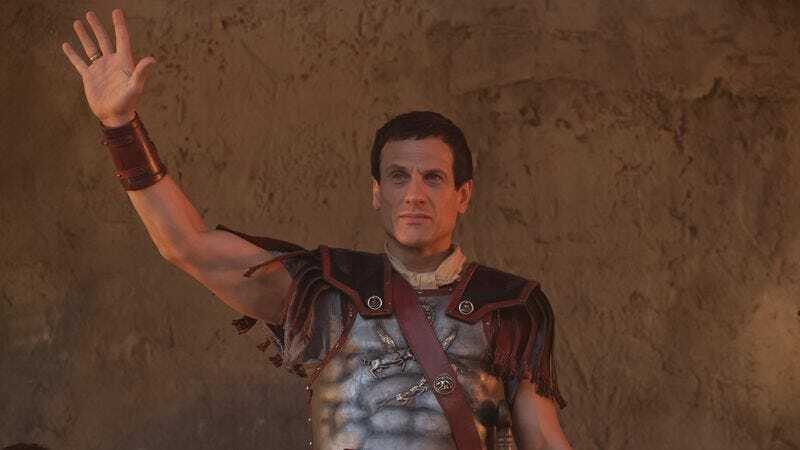 But it’s also part and parcel of what Crassus notes to Laeta when he says both he and Spartacus view themselves as the heroes in this story. Depending on what evidence you serve to present your case, both sides hold merit. Spartacus has trained its audience to sympathize with both sides throughout its run, highlighting the strengths and frailties of either side. We know enough about those under Spartacus that a brief line or two can speak volumes. But these Romans are relatively new to the stage, and need more dimensionality before the final curtain falls. Crassus is a calculating monster, able to reintroduce the concept of decimation in order to inspire fear in his troops. He can smile and lie to everyone’s face without the slightest bit of misapprehension. But he’s also a man who married the wrong woman, is in total love with his slave, and is a well-meaning but misguided father. Learning what Tiberius did to Kore will probably undo all the glory and accolades that await him should he earn the victory we expect. In attempting to make his son into a man, he instead turned his offspring into the living, breathing embodiment of jealousy, rage, and resentment. That Crassus decides to keep Sinuessa as a trophy does not mean he will deserve the emptiness and horror that will befall him upon learning the truth about his son. In turning the final corner of the series into the home stretch, what all of this bloodshed over the course of the show’s run boils down to is not so much how things end but the process by which these characters arrived at that end. In attempting to keep his followers from turning into the very thing that they rebelled against, Spartacus instilled an ideal that took hold in many, if not all, of those under his direction. The moral philosophy lies not in the act, but the intent of the act. 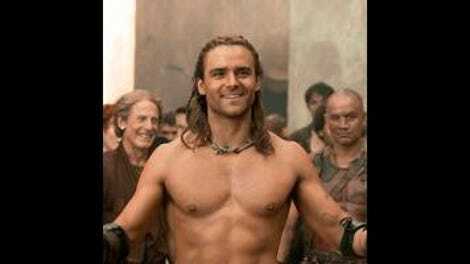 In this respect, Gannicus’ storyline with Sibyl offers the clearest, cleanest summation of this ethos. While the pair hides in the very stable that once housed some of Laeta’s friends, Gannicus despairs that all he has done over the course of his post-arena time has made no difference. Sibyl assures him that everything he has done has changed her life completely, therefore has made all the difference in the world. Crassus foresees his name in the history books, but we know all too well that the motivation for the acts of so many depicted in Spartacus are not in those tomes. That gives the show plenty of artistic leverage, but also indicates just how easily “facts” can denote historical importance but not always cultural importance. That the very name “Spartacus” itself hides the true name of the Thracian depicted in this show demonstrates how much symbolism can flame inspiration and defy objective analysis. The name “Spartacus” doesn’t stand for an ideal. It stands for a multitude of ideals, each one as individual as the snowflakes that fall upon the rebels upon the mountain ridge. The ideal that Donar died for in final defiance of Rome is related to, but ultimately different from, those that he once stood beside. Caesar and Crassus sense the futility of their approach in that moment, even while standing on the precipice of what the Senate would deem imminent and total victory. History is nominally written by the winners, so the saying goes. So why are we still talking about both sides? That’s why Donar’s fight with Caesar is so important to our overall understanding of the final message Spartacus as a show is attempting to impart. On one level, the staging of it feels so close to the days in which the show depicted life inside the arena that you’d be forgiven for experiencing déjà vu. (Anyone else look for Ilithyia to pop into frame and try and seduce Caesar?) For the Romans, the carnificina symbolized not only a way to celebrate victory but also an attempt to recreate the conditions rendered asunder by Spartacus himself back in “Libertus.” But Donar’s refusal to play along with their Roman reindeer games indicates that simply resetting the clock and going back to the way things were before the rebellion won’t be possible. Crassus may amass his fortunes. But he’ll spend them inside a world that has forever changed. I’m focusing on that scene in particular since most of the rest of the episode was a breather/table setter for the final four. There were plenty of good and necessary scenes (Crassus tricking Laeta, Caeasar/Tiberius continuing their feud, Tiberius turning up the creep factor by another thousand with Kore), but these were “what you see is what you get” type scenes that don’t require much in the way of unpacking. We learn at the end why Crassus is so chill about leaving Spartacus to run towards the ridge: Apparently, having as much coin as Crassus does means you can hire people to invent snowblowers in order to trap your enemy high in the snowy mountains. There’s a danger in making Crassus too smart by more than half, but again: How this ends is relatively unimportant. The title of this final season indicates that very few of these people are going to make it out alive, and those few that do might wish themselves dead. But there are still chances for some to transform inside this crucible and forge something new, something better, something lasting. These people are damned so that others might be saved. I could have sworn that Heracleo died in “Blood Brothers”. Turns out that was only a flesh wound. Honestly, “death by hot brand through the throat” seems a much worse way to go, so I guess I’m happy about how this all ended up. I’m glad Caesar brought up Glaber’s arrogance to Crassus, since I was thinking the exact same thing. Not sure who is the bigger wild card in camp: Laeta or Crastus. Both seem like they could play a big part in weeks to come. Tug-of-war in Roman times was a lot more brutal than I remember it from my time in grade school. Nice of the show to take Sibyl from symbol into a more three-dimensional character this week. There’s still a ways to go to make her anything more than a conduit for Gannicus’ rehabilitation, but that has more to do with pure screen time than actorly presence.